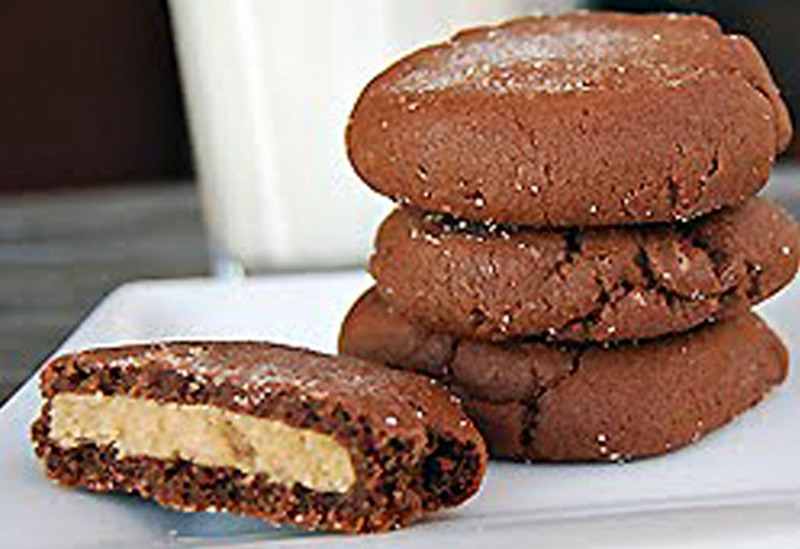 My Oh My these delicious Magic Middle Peanut Butter Cookies might be too good. With their soft, moist chewy goodness – they’ve made my favorite list. Oh! My! Gosh! I mean seriously! I think I should rename these cookies to Danger Will Robinson Cookies. They’re sooo delicious they are truly dangerous. They are soft, moist, chewy, and way yummy! I stashed mine in the back of the freezer hoping to forget about them for a bit. No chance and they’re even fabulous frozen. You have to try these. They have officially gone on my favorite foods of all time list. Bet they’ll go on yours, too. 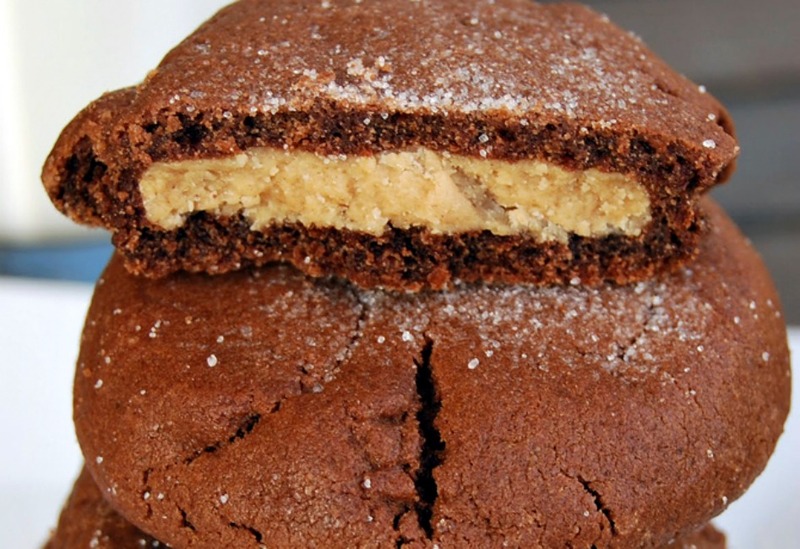 My Oh My these delicious Magic Middle Peanut Butter Cookies might be too good. With their soft, moist chewy goodness - they've made my favorite list. 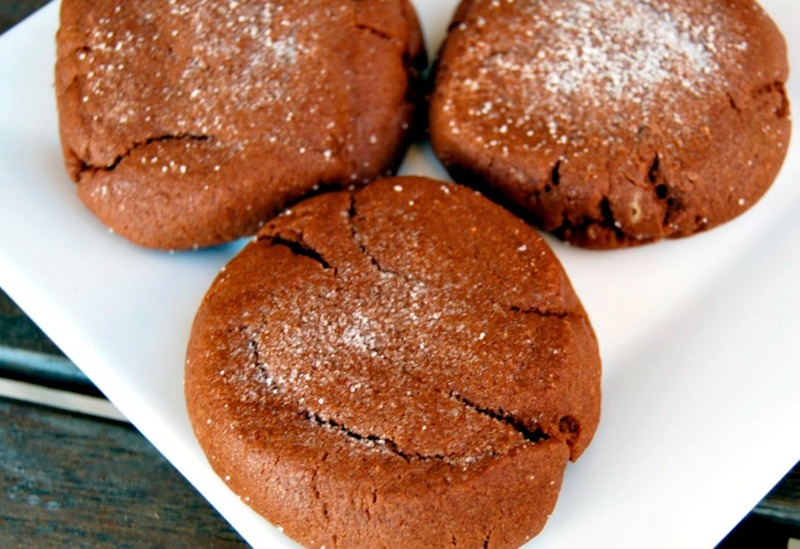 Make Cookies: In a small bowl, blend flour, cocoa, and baking soda. In a large bowl beat white sugar, brown sugar, butter, and 1/4 cup peanut butter, until light and fluffy. Add vanilla and egg, beat until blended. Stir in flour mixture until blended. Set aside. Make the filling: Combining the confectioner's sugar and 3/4 cup peanut butter. Beat well with electric mixer until mixture comes together. Roll filling into 30 1 inch balls. Form exterior part of the cookie by sectioning dough into approximately 1 tablespoon pieces and then shaping the, part of cookie around filling balls. Cover the filling completely. Place 2 inches apart on an ungreased cookie sheet. Flatten with a glass dipped in sugar. Bake at 375 degrees for 7-9 minutes. ( I baked mine for 7 minutes ). Allow cooling on cookie sheet for 10 minutes then remove to a cooling rack and cool completely. Previous RecipeCoconut Cupcakes With Thick Coconut Frosting! Thank you! I just made these tonight and they were unbelievable. My husband wants to eat them all. Thank you for sharing. These sound so delicious that even Santa (who's tasted all the cookies in the world), will loosen his belt for these Magic Middle masterpeices. Man, your blog is soooo bad for my expanding tush, but who cares. I'm more into exercising my mouth and tongue by chewing anyway. Another treat that I'll make and I think my nieces and nephews will like them as well. I'll be making these this week. They look fabulous, plus I can freeze them. What more could you ask for. Just to thank you for your awesome recipe, I made your cookies and they are divine. I have posted them on Magic Flavours too. This might put a dent in my weight loss plans! I can't WAIT to make these. I LOVE anything and everything to do with PB and then you throw the chocolate in there… i'm so done! Thanks for sharing and thanks for stopping by my blog. So happy that I found this blog! I am printing this recipe out right now! My daughter was trying to figure out how to do this and they just would not work. She was improvising, so she could have left out a crucial step and we live at altitude which may have caused troubles, but I am going to have her look at your recipe and try it again! BTW, all of her flops tasted great! What a great recipe. My chocoholic side is jumping with joy. Woahh! Those look amazing! PB & chocolate is my favorite for sure. wow i think i have to make these! These look sooo good. Like a reese's peanut butter cup in cookie form!! they're so cute with the 2=toned colors. OMG is right! These look amazing! Great recipe!! These have me drooling – I'm a total fiend for chocolate & peanut butter. dangerous indeed! the peanut buttery innards of your cookies looks like just the right amount to compliment the chocolate blanket–nicely done! OK, now you've done it. I will just have to make these. Thanks. A. Lot. HUGS!!!! They look like they'd be a favorite here, too. Seriously, they look and sound amazing. Will definitely be trying these soon. Thank you! oh wow! can't wait to try these..my kids are asking for them now! Oh my gosh! I love PB and chocolate! I will be making these for sure! Yum!!! Wow! Those look great! Thanks for the recipe! Incredible cookies. These go to the top of the cookie list. These are amazing. I just made them and my boyfriend and his roommate are gobbling them up…I'm helping quite a bit too. Thanks! Yeah, Danger Will Robinson agreed! I don't think those would last an hour in my place. These really would be dangerous…I don't think that I could stop eating them. Wonderful recipe! What beautiful cookies! I want some! They are delicious, aren't they? This is one of my favorite recipes. These look absolutely, positively incredible! A keeper for sure! These look totally scrumptious! I would not even have the willpower to freeze them. My favorite combo in cookie form – hard to resist! i love cookies that have a surprise in the middle. these look incredible, magic indeed! Wow, they do look magical.. and addictive! These do look delicious!! I am going to have to try them. gorgeous.. I am making these this week. I loved how you tried to hide them in the back of the freezer and then ate them frozen:D That sounds exactly like something I would do. There isn't much that gets in the way of me and the duo of peanut butter and chocolate! They look delicious. I'm going to keep them in mind next time I make some cookies. Why do I not have peanut butter in my cupboards now. Can i say, you have just made my morning. I'm off to find the ingredients for these. Now. You are tempting me! If only we can do cookie exchange via the internet….. These look delicious!!! I am going to give them a try, thank you for the recipe!!! These look great! I will have to put them on my to-do list! Oh Yum! I'm making these this weekend ~ thanks for sharing! Do you mean “Danger Will Robinson”..great name for a cookie that I will now have to make..
Two of my favorite food groups. Peanut butter and chocolate. will be back to check out more beautiful recipes!!! Wow, thanks for sharing this awesome cookies recipe. Is coming home with me.